Hydro Energy is the technology that converts the energy of moving water into mechanical or electrical energy, and one of the earliest devices used to convert the energy of moving water into usable work was the Waterwheel. Water wheel design has evolved over time with some water wheels oriented vertically, some horizontally and some with elaborate pulleys and gears attached, but they are all designed to do the same function: convert the linear motion of the moving water into a rotary motion which can be used to drive any piece of machinery connected to it via a rotating shaft. These vertical waterwheels were vastly superior to the earlier horizontal waterwheel design by the ancient Greeks and Egyptians, because they could operate more efficiently translating the momentum of the moving water into power. Pulleys and gearing was then attached to the waterwheel which allowed a change in direction of a rotating shaft from horizontal to vertical in order to operate millstones, saw wood, crush ore, stamping and cutting etc. Most Waterwheels also known as Watermills or simply Water Wheels, are vertically mounted wheels rotating about a horizontal axle, and these types of waterwheels are classified by the way in which the water is applied to the wheel, relative to the wheel’s axle. As you may expect, waterwheels are relatively large machines which rotate at low angular speeds, and have a low efficiency, due to losses by friction and the incomplete filling of the buckets, etc. The action of the water pushing against the wheels buckets or paddles develops torque on the axle but by directing the water at these paddles and buckets from different positions on the wheel the speed of rotation and its efficiency can be improved. The two most common types of waterwheel design is the “undershot waterwheel” and the “overshot waterwheel”. The Undershot Water Wheel Design, also known as a “stream wheel” was the most commonly used type of waterwheel designed by the ancient Greeks and Romans as it is the simplest, cheapest and easiest type of wheel to construct. 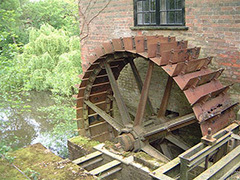 In this type of waterwheel design, the wheel is simply placed directly into a fast flowing river and supported from above. The motion of the water below creates a pushing action against the submerged paddles on the lower part of the wheel allowing it to rotate in one direction only relative to the direction of the flow of the water. This type of waterwheel design is generally used in flat areas with no natural slope of the land or where the flow of water is sufficiently fast moving. Compared with the other waterwheel designs, this type of design is very inefficient, with as little as 20% of the waters potential energy being used to actually rotate the wheel. Also the waters energy is used only once to rotate the wheel, after which it flows away with the rest of the water. Another disadvantage of the undershot water wheel is that it requires large quantities of water moving at speed. Therefore, undershot waterwheels are usually situated on the banks of rivers as smaller streams or brooks do not have enough potential energy in the moving water. One way of improving the efficiency slightly of an undershot waterwheel is to divert a percentage off the water in the river along a narrow channel or duct so that 100% of the diverted water is used to rotate the wheel. In order to achieve this the undershot wheel has to be narrow and fit very accurately within the channel to prevent the water from escaping around the sides or by increasing either the number or size of the paddles. The Pitchback Water Wheel Design is a variation on the previous overshot waterwheel as it also uses the gravitational weight of the water to help rotate the wheel, but it also uses the flow of the waste water below it to give an extra push. This type of waterwheel design uses a low head infeed system which provides the water near to the top of the wheel from a pentrough above. Unlike the overshot waterwheel which channelled the water directly over the wheel causing it to rotate in the direction of the flow of the water, the pitchback waterwheel feeds the water vertically downwards through a funnel and into the wheel just below the top causing the wheel to rotate in the opposite direction to the flow of the water above. The advantage of this is that the efficiency of the waterwheel design is greatly increased to over 80% of the waters energy as it is driven by both the weight of the incoming water and by the force or pressure of water directed into the buckets from above, as well as the flow of the waste water below. The disadvantage though of an pitchback waterwheel is that it needs a slightly more complex water supply arrangement directly above the wheel called the “pentrough”. The Breastshot Water Wheel Design is another vertically-mounted waterwheel design where the water enters the buckets about half way up at axle height, or just above it, and then flows out at the bottom in the direction of the wheels rotation. Generally, the breastshot waterwheel is used in situations were the head of water is insufficient to power an overshot or pitchback waterwheel design from above. The disadvantage here is that the gravitational weight of the water is only used for about one quarter of the rotation unlike previously which was for half the rotation. To overcome this low head height, the waterwheels buckets are made wider to extract the required amount of potential energy from the water. Breastshot waterwheels use about the same gravitational weight of the water to rotate the wheel but as the head height of the water is around half that of a typical overshot waterwheel, the buckets are a lot wider than previous waterwheel designs to increase the volume of the water caught in the buckets. The disadvantage of this type of design is an increase in the width and weight of the water being carried by each bucket. As with the pitchback design, the breastshot wheel uses the energy of the water twice as the waterwheel is designed to sit in the water allowing the waste water to help in the rotation of the wheel as it flows away down stream. Historically water wheels have been used for milling flour, cereals and other such mechanical tasks. But water wheels can also be used for the generation of electricity, called a Hydro Power system. By connecting an electrical generator to the waterwheels rotating shaft, either directly or indirectly using drive belts and pulleys, waterwheels can be used to generate power continuously 24 hours a day unlike solar energy. If the waterwheel is designed correctly, a small or “micro” hydroelectric system can produce enough electricity to power lighting and/or electrical appliances in an average home. Look for Water wheel Generators designed to produce its optimum output at relatively low speeds. For small projects, a small DC motor can be used as a low-speed generator or an automotive alternator but these are designed to work at much higher speeds so some form of gearing may be required. A wind turbine generator makes an ideal waterwheel generator as it is designed for low speed, high output operation. If there is a fairly fast flowing river or stream near to your home or garden which you can use, then a small scale hydro power system may be a better alternative to other forms of renewable energy sources such as “Wind Energy” or “Solar Energy” as it has a lot less visual impact. Also just like wind and solar energy, with a grid-connected small scale waterwheel designed generating system connected to the local utility grid, any electricity you generate but don’t use can be sold back to the electricity company. In the next tutorial about Hydro Energy, we will look at the different types of turbines available which we could attach to our waterwheel design for hydro power generation. For more information about Waterwheel Design and how to generate your own electricity using the power of water, or obtain more hydro energy information about the various waterwheel designs available, or to explore the advantages and disadvantages of hydro energy, then Click Here to order your copy from Amazon today about the principles and construction of waterwheels which can be used for generating electricity. I am a science teacher and I would like to purchase a small water wheel to put on a display I am making. Where could I purchase one that would power some small LED lights. I want to make a water feature from copper tubing and have it spill onto a water wheel then the water wheel can create electricity to power the LED lights. You can purchase the items you are looking for from Amazon. Possibly this Water Wheel Activity or other may be what you are looking for. We have a overshot stainless steel and steel water wheel 7meters dia. x 0.6 meters wt. in Normandy France driving a old big David Brown stone breaking gearbox which then drives via a 1 meter to 100 mm pulley a Tractor PTO generator which has a built in 3 to 1 gearbox The waterwheel goes at about 5 RPM and the generator about 1500 RPM . We have a lot of losses in the gearbox’s and only get about 3 KW We have a lot more water than the wheel can take. How can we have less losses. Please Help. As well as converting input and output shaft speeds and forces, gearboxes are also a major source of system losses, through friction, vibration, noise and heat. One way to reduce these losses and improve percentage efficiency (that is output power/input power) is for the gearbox to work less harder, either by changing the ratio of the cogs, thickness (viscosity) of the lubricating oil inside, or by the re-aligning of the transmission shafts and/or couplings, etc. An alternative could be to replace the gearbox with a pulley system using flat, v-shaped or toothed belt drive, not chain, or by one which is more efficient using helical gears. What specifically should I look for in the topography of the land for optimal construction of a water wheel? I am not as interested in the calculations of the energy output here, and I understand that different style wheels work better than others based on case by case circumstance; but in this case I am choosing the land prior to constructing the wheel, thus I am more interested in assessing/comparing various parcels of land for optimal use of micro hydro energy production on a relatively small parcel of 4-6 acres or so. I understand creating head is essential and am pursuing only property with with creeks on a sloping/foothill terrain, but what additional features in the land should I look for when procuring such a small portion of land along a creek or stream? What are the designs or pitfalls of diverting and returning water to the source? Is it best to try to divert water in as straight a line as possible or can you use a right angle after the water travels away from the wheel? Do particular diversion methods work better for shorter vs longer lengths? For faster/slower moving water? For shallow/deeper water sources? Does PVC pipe serve better than open carriers? Etc. I would imagine the side of the water source that exhibits more flood plain indicates topography that is lower and thus would naturally divert water with less resistance, but then returning the water to the original source might be more challenging or require a longer path. So is it better to construct on a the side with less flood plain? That may require a deeper trench or diversion path but a shorter distance to return the water to the original source? It seems less costly to dig…. unless there is rock and improving the terrain to suite my needs might then require costly outsourcing of equipment that I would rather not get into, (unless I can do it myself? as a 120 lb female who does not own or frequently use larger construction machinery etc.) A natural bend in the stream seems convenient but may not be realistic on such a small parcel. Its easy to say, ‘Buy property with a stream or creek that has sloping topography’, but a bit more challenging to look at several parcels with mediocre potential and have a good understanding of the comparative energy production potential without going out and getting a survey for each prospective parcel right off the bat. Opinions on how to work with the land to create optimal head with efficient use of construction and materials is welcome… please. Coupd I make like a makeshift fountain with a nice water pump to create a water current then plug the pump into what’s generated? Pulleys and a drive belt, or chain. Most gearboxes have an input drive and output drive so are non-reversable. Hello I’m designing an undershot water wheel to install in a canal where flow rate of water is about 1.5 m3/s. Can anyone suggest me the optimal size of water wheel which will give maximum RPMs at this situation. i would like to know what are the related formulas needed to design a undershot water wheel. All these factors dictate the rotational velocity of the wheels shaft, and ultimately its power output and efficiency. Although easy to build, a major disadvantage of the undershot wheel is the variability in the river’s water level because if the water level falls too much the wheel may be entirely out of the water, making it useless. A breast waterwheel is more efficient as it uses both the kinetic and potential water energy to drive the wheel as the water enters at or near the mid-point (breast) of the wheel. The key elements I look for are volume and velocity throughout the year (availability). The formula for potential is Pth=1/2Q*M*V2 (V squared). Our system in a run of the river configuration averages ~35%-40% efficiency (water to wire). I would try to keep the diameter of the wheel at least 4x the blade, but you may want larger to increase torque. The number of blades will need to reflect the diameter and depth. Shoot me an email using the info request on the website if I can be of assistance. Hello Andrew, Its difficult to comment exactly without seeing the installation, but a couple of hundred years ago, hydroturbines were a rather basic and crude affair with head race, penstocks, turbine blades, and tub all made from wood. From what I understand, water was stored above in pits or large wooden barrels or tubs to create a head and water pressure. When a sluice gate was opened, water dropped vertically through a wooden box or tube and entered at considerable rotational velocity hitting the large wooden blades/paddles of a horizontal water wheel below which turned a vertical shaft. The pre-swirl effect within the wooden tub that enclosed the blades, combined with the weight of water above the wheel, was the main driving force with a hole at the bottom of the tub to drain used the water. Anybody know of research on floating, i.e. flow of river, waterwheels? We are trying out various designs, layouts and even state of the art equipment for maximising the efficiency but it would be interesting to see what other people have been up to. Hello, I am an Hydraulic engineer and I do research activity on water wheels. 1) Quaranta, E., Revelli, R., (2015). Output power and power losses estimation for an overshot water wheel, Renewable Energy, (83), 979-987. 2) Quaranta, E., Revelli, R., (2015). Performance characteristics, power losses and mechanical power estimation for a breastshot water wheel, Energy, (87), 315-325. You can write the title followed by “researchgate” and you should be able to download them. Hello, I’m in college and we are working on a WW project. We are working with a wheel with a 2.3 m diameter. We are to design the buckets and calc power and efficiency. I have got the power and I have Q for the feeder steam. Any help with how to calc efficiency would be helpful, thank you. Can anybody give the design, consideration and principle of undershot waterwheel. I want to make a water wheel which produce power from the jet of tube well,can you help me or give me the proper design of water wheel which can produce about 300 Watt electricity. Hello Husnain, you have answered your own questions. Then you need a waterwheel with a diameter of 3 feet, attached to a 300 watt DC or AC generator. I see, that http://www.alternative-energy-tutorials.com has fresh and unique content. I know it’s hard to write content manually everyday, but there is solution for this. Simply search in google for your topic. Is there any way I can get your name / experience with this? I’m using it as a citation in my school’s project and I want to be careful to cite correctly. can water wheel be driven by using 1/2 HP water pump to rotate a large wheel to have more than 1/2 hp power? Yes its possible for a water pump to drive a water wheel to increase speed or distance, etc. but the output power would be less than the input due to losses in the system. Then it would not produce more than 1/2hp at the output. I would like to know the load torque and flow torque for undershot waterwheel and rotational speed design calculation.